CCS, Art Center, Coventry, Pforzheim. To those in the car industry, and specifically the design part of it, these names will be well known. They represent the handful of educational establishments with dedicated automotive, or transportation design courses that exist around the world. It's likely that the person heading the team of designers who designed the car you're currently driving, attended one of these schools. Perhaps most renowned of all the educational establishments teaching vehicle design though, is the Royal College of Art in London - whose graduates include Peter Stevens (McLaren F1), Peter Horbury (a multitude of Volvos), Peter Schreyer (TT), Marek Reichman (Aston Martin) and Martin Smith (recent European Fords). Which is why half of the auto design industry appears at Kensington Gore, every year, on one (typically hot and sweaty) night in late June, as the current year's crop of MA students graduate, showing off their final projects. 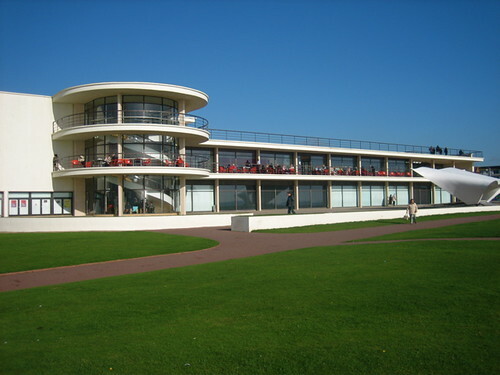 This year, their challenge of securing a job in one of the world's handful of automotive design studios is made all the more challenging by the economic meltdown - which has seen car makers go bankrupt, selling 30% fewer cars than a year ago, and shutting down design outposts. This year, two of the most interesting projects on show come from Magdalena Schmid and Hong Yeo - and we captured their projects, and the conceptual thinking behind them on video. They're well worth checking out... (yes I know we would say that) but these models are the result of many months of hard labour, and are quite beautiful objects in their own right. More than that though, what these designers have to say, and their respective attitudes towards the industry, gives hope that the flagging auto industry could still have a bright future. Oh, and if you know of a job going in a design studio near you, then they'd love to hear from you! (their email addresses are at the end of their respective videos). Disclosure: Joseph Simpson is a visiting lecturer on the Vehicle Design course at the RCA, and graduated from the college with an MPhil in Vehicle Design in 2009. Honda's Insight left the official Movement Design Bureau parking space (alright, the road outside the office) just over a week ago now, so having produced this light-hearted video review towards the end of its time with us, we've now had the chance to think about the car a little longer. Our lasting impression? A total bag of contradictions. The Insight is at once both deeply impressive and yet slightly disappointing. Why? In short, because Honda has managed to wrap apparently smart, up-to-the-minute technology in a package that's both easy to live with, fine to drive and affordable for the average c-segment (think Golf, Focus) car buyer. Yet at the same time, that technology failed to deliver real world results in our hands, and out of a town environment, the Insight feels out of its depth - leaving us questioning the point of that slippery, low-drag 'kamm-tail' shape and the packaging compromises it has created elsewhere in the car. We're going to explore some of the innovative thinking behind the Insight, and Honda's overall future strategy in a forthcoming blog, which will feature the interview we did with Honda UK's head of environment and government affairs - John Kingston - while we had the Insight. Pretty? Not really, but hardly repulsive either. That high, chopped-off tail, and steeply sloping rear roofline combine to create what's known as a 'kamm-tail'. Invented (discovered?) by German design-engineer, Wunibald Kamm, it reduces the air turbulence thrown off the back of the car at speeds - which in turn reduces aerodynamic drag. Roland Barthes suggested that cars were the modern day equivalent of Gothic Cathedrals, “the Supreme creation of an era. Conceived with passion by unknown artists”. That's still true to this day. While fashion designers and architects have become household names and outright superstars, car designers are little known, often lost in the cloak of their brand’s identity. Of all the names that the average non-car nerd may have heard of, three are most likely to stand out: Patrick le Quement, Chris Bangle, and J Mays. So with le Quement retiring after 22 years as head of Renault design, and Bangle recently leaving BMW under unclear circumstances, this leaves Mays as arguably the most publicly recognisable car designer in the world right now. Clearly, he’s got more time to focus on making Ford’s core products stellar once again (recent cars such as the Flex and Taurus suggest this is already happening), along with giving under-nourished Lincoln and Mercury some love too. It’s the Lincoln C concept – unveiled at Detroit’s NAIAS in January 2009 - that we were primarily in town to talk to him about. Yet while that car is well worth a closer look, it’s the bigger issues facing the car industry and the world of car design that we really wanted his views on. So here, Mays - the man behind VW's famous Concept One and Audi's influential Avus – who now also acts as Ford’s Chief Creative Officer, gives his views on a whole host of design subjects. From why the computer is today’s hotrod, to how he believes Ford is leading the way in user research, and why the skill-set of tomorrow’s car designer might need to be quite different to that of today’s. When I grow up, can I grow car parts please? Earlier this month Joe and I got to spend time with the amazing all-women team of chemists - aka the "Bio Babes" - at Ford's Materials Research and Advanced Engineering Department in Dearborn, Michigan. I posted photos that day here. It was a reminder for me that behind the suits, politicians and whining salesmen we've seen on TV recently, there's an amazing world of designers and engineers doing really cool stuff that will, in this case literally, shape completely new kinds of vehicles. When we get on and let it. Joe's now created a three minute video about the story below. But I've also sneaked in a full-cut five minute video of the marvellous Christine Perry, the celebrity chef of advanced materials research, growing soy before our eyes. It was like being in the coolest chemistry class of the year. Indeed, if you loved science class, yet face yet another year sitting in front of a desk pushing paper, take heart - and tell your kids - that there's a world out there where people get to spend every day mixing old ideas with new, literally growing the pieces that will become the cars of the 21st century. Mark is a founder of The Movement Design Bureau. Disclosure: Ford's sponsoring our research team this year. Our brief is take an independent perspective on its sustainable design work and gather opinions and encourage interaction from the wider design community. We'll work hard to maintain that perspective, but tell us if you don't think we do. Joe and I were privileged to meet the ladies of the Materials Research and Advanced Engineering Department at Ford in Dearborn, Michigan, today. We filmed Deb Mielewski, Cynthia Flanigan, Angela Harris, Ellen Lee, and the marvellous Christine Perry, the celebrity chef of advanced materials research. She grew soy foam in front of our eyes. 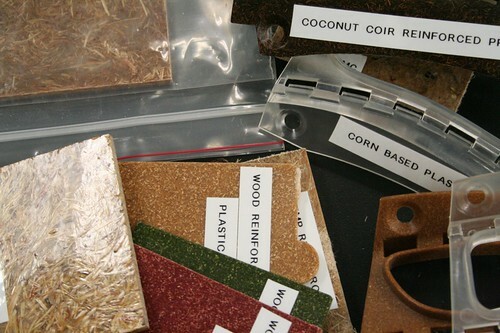 The team explained how they research ways to incorporate natural materials into car components. This can reduce the amount of petroleum involved in car manufacture, make vehicles easier to recycle and produce more interesting, attractive, lighter-weight and environmentally sustainable materials than we've ever seen before in cars. Bill Ford kicked this programme off in 2001 and it was the first of its kind in the world. You can see photos of our time by clicking on the montage below. Updated: Videos of our time with the team can be viewed here. 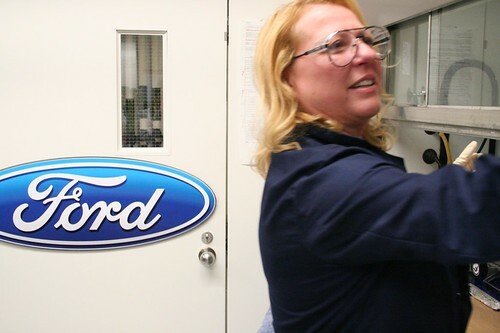 Photo: Christine Perry, formulation chemist, Materials Research & Advanced Engineering Department, Ford, Dearborn, Michigan. Disclosure: The Movement Design Bureau has been commissioned to follow Ford's sustainable design work. We aim to snap things with an independent take. Tell us if you think we don't.